Our Texas Research Division just released some pretty exciting news. Deputy Dawg Dan and Spicy Salsa Marjan made the exciting announcement of the arrival of the newest Hot Dogger, Henry. Henry weighed in at 7 lbs, 7 ozs. and was born today, 11/11. So, this lucky little guy will be known as The Hot Dog Cowboy. When he gets a little older and orders his monogrammed dress shirts (his daddy was six years old when he ordered business cards so monogrammed shirts probably aren't that far in the future) his luck will shine through once again. The Hot Dog Cowboy need not worry about a separate set of shirts with his Hot Dog initials (like the rest of us that need to keep two separate wardrobes). Frankly, Hot Diggity and Yank are feeling like Lucky Dogs! It's Saturday and Hot Diggity and I found a new relish to try. Have you ever heard of Zucchini Relish. We sampled it at a local Farmers' Market and it was very good. Of course, I had to put it to the hot dog test. 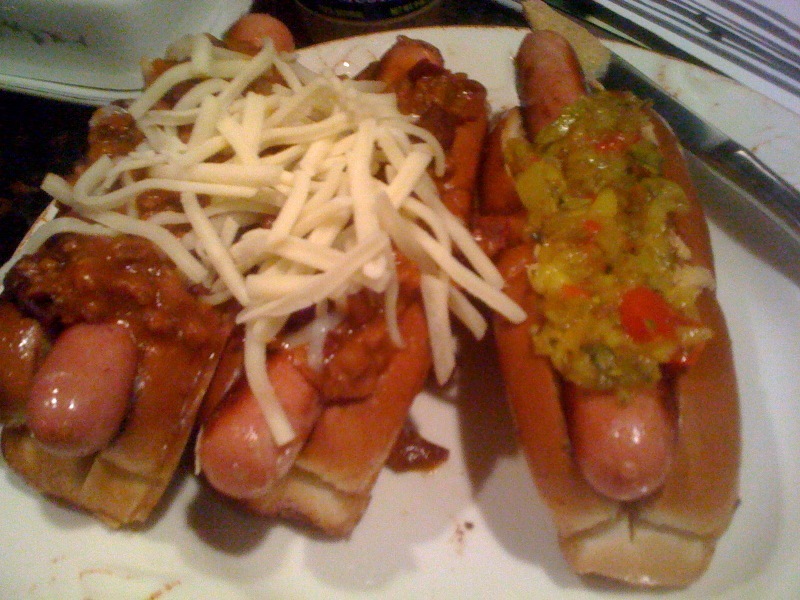 So what you see below is my Zucchini Relish and Kosciusko Mustard Dog (for research purposes) and two Chili Dogs with Cheese (because I was dying for Chili Dogs). The result...the Zucchini Relish was very good, however it is not different enough from our sweet relish to add to our offerings. 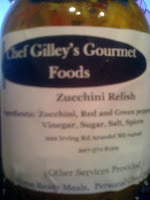 We will keep looking and we will invite others to try the Zucchini Relish to get more opinions. The Chili Dogs were made with Yank's Beantown Chili (as opposed to our regular Chili Dogs that were made with Angus Steak Chili). Whenever and where ever I have Chili, it needs to be topped with shredded cheddar. The Chili Dogs were awesome! Our Beantown Chili is just spectacular. We will likely have it on our menu next Spring. Now for my problem. I ate these hot dogs a little after 9:30 pm this evening. I could go to bed an hour late, after all we set the clocks back tonight. I'll break even on sleep while most of you get your extra hour, but that's the price I'll pay. Wait a minute, I have another idea. Maybe if I chase those dogs with a bowl of Ben and Jerry's everything will even out. Yeah, that's what I'll do. Enjoy your extra hour of sleep. I intend to as well. Frankly, blah, blah, blah...gotta go to bed!